TASCHEN's 25th anniversary - Special edition! 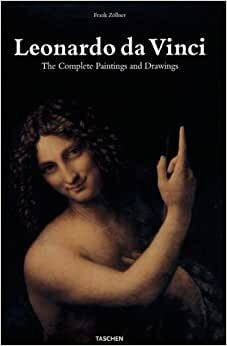 Special bestseller price Leonardo da Vinci (1452-1519) possessed one of the greatest minds of all time; his importance and influence are inestimable. This XXL-format comprehensive survey is the most complete book ever made on the subject of this Italian painter, sculptor, architect, engineer, scientist and all-around genius. With huge, full-bleed details of Leonardo's masterworks, this highly original publication allows the reader to inspect the subtlest facets of his brushstrokes. * Part I explores Leonardo's life and work in ten chapters. All of his paintings are interpreted in depth, with The Annunciation and The Last Supper featured on large double-spreads. * Part II comprises a catalogue raisonn? of Leonardo's paintings, which covers all of his surviving and lost painted works and includes texts describing their states of preservation. * Part III contains an extensive catalogue of his drawings (numbering in the thousands, they cannot all be reproduced in one book); 663 are presented, arranged by category (architecture, technical, anatomical, figures, proportion, cartography, etc). This sumptuous TASCHEN offering is the most thorough and beautifully produced Leonardo book ever published, and this special edition offers it for a third of the usual price. "Opening this lavishly illustrated book is one of sumptuous celebration of the visual aspects of Leonardo's oeuvre." The book is very nice, with beautiful pictures, printed on glossy paper, but the size of the book itself is rather small.